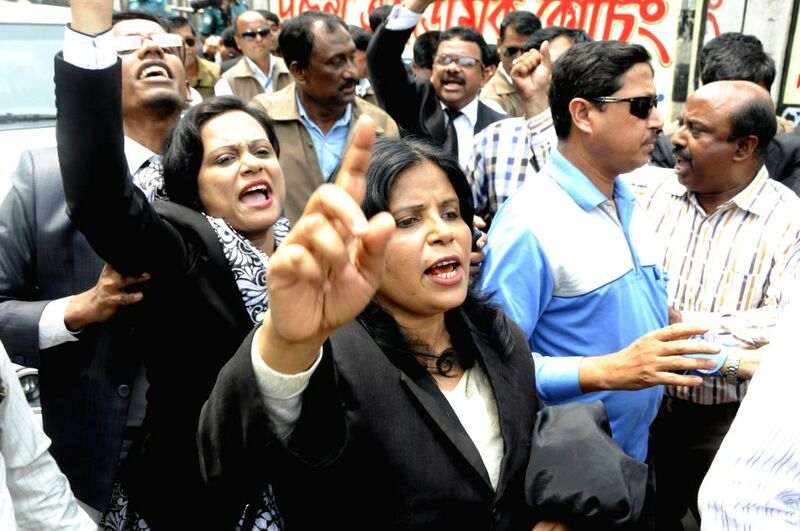 DHAKA, April 5, 2015 - Supporters of Bangladesh Nationalist Party (BNP) shout slogans during a trial against Bangladesh's former Prime Minister and BNP leader Khaleda Zia in Dhaka, Bangladesh, April 5, 2015. A court in Bangladesh's capital Dhaka has granted conditional bail to ex-Prime Minister Khaleda Zia in two cases filed by the country's anti-graft body. The court on Feb. 25 issued an arrest warrant against Khaleda Zia, scrapping her bails in the Zia Orphanage Trust and Zia Charitable Trust cases.